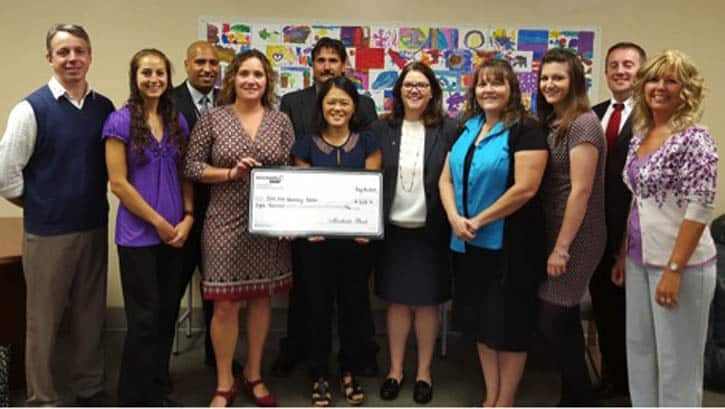 RUTLAND—The Merchants Bank Foundation has awarded an $8,000 grant to the Child First Advocacy Center (CFAC). The grant will help promote community awareness of child sexual abuse and bolster prevention efforts along with alternative forms of treatment to help support recovery in Rutland County. CFAC is a fully accredited member of the National Children’s Alliance. Child advocacy centers are designed to coordinate a response to abuse allegations in a safe and supportive environment. CFAC provides a child-friendly setting conducive to physical and psychological safety to assist victims and their families in the discovery, intervention, treatment and prevention of child sexual and severe physical abuse. The incidence of child sexual abuse is often misunderstood and underrepresented. According to national statistics. one in 10 children will be a victim of child sexual abuse before the age of 18. Approximately 90 percent of children are abused by someone they know and trust. Victims of child sexual abuse have significant chronic health problems, from eating disorders and pregnancy to suicide attempts. Utilizing a multidisciplinary joint investigative approach, the Child First Advocacy Center teams with law enforcement, the Department of Children and Families, the Rutland County State’s Attorney’s Office, victim advocate services and medical and mental health professionals. Additionally, the Rutland Office for Special Investigations (ROSI) coordinates with the Child First Advocacy Center team. The Child First Advocacy Center offers trainings for organizations, towns and communities. For more information contact CFAC at 802-747-0200.